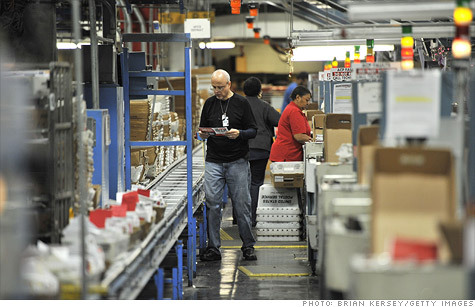 The Postal Service wants to cut 150,000 jobs by 2015. NEW YORK (CNNMoney) -- The U.S. Postal Service is offering buyouts to 45,000 mail handlers, part of the struggling agency's efforts to shed staff and cut costs. The $15,000 buyouts, pro-rated for part-time staff, are available to nearly all of the Postal Service's mail handlers, excluding around 2,000 who aren't career employees. Mail handlers work at post offices and mail processing centers sorting mail, transporting it within their facility and loading and unloading trucks. "The Postal Service is adjusting the size of its network to adapt to America's changing mailing trends," USPS spokesman Mark Saunders said in an email Friday. The Postal Service wants to reduce its workforce by 150,000 by 2015, though Saunders said he had "nothing to announce" regarding potential buyouts for other USPS employees. The offer for mail handlers, finalized earlier this week, came as a result of talks between the Postal Service and the National Postal Mail Handlers Union. In a statement Thursday, the union said the deal "is intended to provide a financial cushion, and added peace of mind, for Mail Handlers who might be prepared to move on to the next chapter of their lives." A USPS spokesman said accepting the buyout offer would have "no effect" on pre-existing pension agreements. As is the case in many pension plans, however, USPS employees receive reduced benefits if they retire early. The Postal Service reported a $3.2 billion loss for the first three months of this year. The recession, declining mail volumes and a congressional mandate to pre-fund retirement health care benefits drove the losses. The health care mandate is a major liability for the Postal Service, which doesn't have the cash to make a $5.5 billion payment that's due in August. The Postal Service supports itself on sales of postage and mail services, and gets no taxpayer funding. Earlier this month, the agency announced that it was averting previously-planned closures of rural post offices and delaying consolidations of postal plants. Some 48 plants are still set to be closed or consolidated in July and August, and others could follow in 2013 and 2014.